This informative and easy-to-read book is the story of the people who battled over the meaning of the mysterious number - the scholars and mystics, the scientists and clergymen - who tried to understand zero. It is hard to believe that there was once a time when zero didn't exist, but zero was a relatively recent invention; born as an Eastern philosophical concept its history is one of struggle and intrigue. This informative and easy-to-read book is the story of the people who battled over the meaning of the mysterious number - the scholars and mystics, the scientists and clergymen - who each tried to understand zero. It involves Archimedes, Aristotle, Newton and Stephen Hawking, and is a history of the paradoxes posed by this innocent-looking number, rattling even this century's biggest minds and threatening the unravel the whole framework of scientific thought. 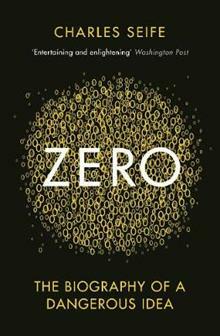 The story of zero involved not only mathematics but history. The clashes over zero were the battles that shook the foundations of philosophy, of science, of mathematics, and of religion. Underneath every revolution in the last millennium lay a zero. Charles Seife earned his BA in mathematics from Princeton University, an MS in mathematics from Yale University, and an MS in journalism from Columbia University. Trained by such mathematicians as Andrew Wiles, who solved Fermat's Last Theorem, and John Conway, who invented the 'game of life', Seife has done research in probability theory, artificial intelligence, signal processing, and the visualisation of the multidimensional spaces. He has worked for the Department of Defense and is currently an American correspondent for New Scientist. He has also written for numerous other publications including Scientific American, Science, The Economist, and Wired UK.